Originally appearing on his 1990 album Ah Via Musicom, Cliffs of Dover has become the song most associated with guitar legend Eric Johnson. Known for his impeccable tone, killer chops and strong sense of melody, “Cliffs of Dover” features all of these and more in what many would consider to be the guitarist’s magnum opus. While you might think that tackling such an epic and well-known song might not the best idea for another guitarist, acoustic guitarist Rhett Butler has recently proved that in the right hands a cover version can live up to the hype of the original, while bringing a new take on a classic track at the same time. An experienced and well-educated guitarist, having studied at the prestigious University of North Texas music program, Rhett is mostly known for being able to play two-guitars at once. 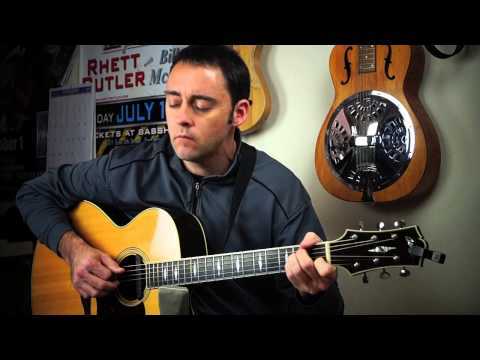 Often times acoustic covers will be watered-down versions of the originals, but not in this case, as you can feel the energy and intensity ringing through on Rhett’s flattop guitar as he interprets this well-known guitar track. To get the TAB for this arrangement, and check out more of his teaching and playing, visit the Rhett Butler Homepage. What do you think of this Cliffs of Dover Acoustic Cover? Share your thoughts in the comments section below. This entry was posted in Acoustic Guitar Songs and tagged acoustic cover songs, cliffs of dover guitar, rhett butler guitar by Alan. Bookmark the permalink. I think this is great. I love the swing feel being stronger; feels more soulful. No knock to Mr. Johnson. Very nice work indeed! Great alternative to the an original classic.